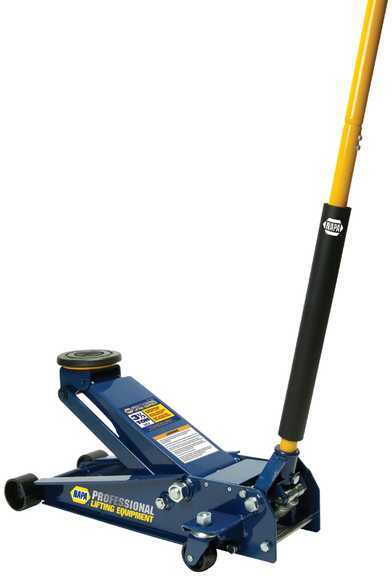 The Napa 791-6420 3-1/2 Ton Capacity Floor Jack will give you a "Quick Lift" " at a competitive price. It only takes one pump to load and three pumps to full height unloaded. An extra wide lift range from 4 " to 21 " and a long 48 " spring loaded handle provide rapid return after each pump. Heavy-duty construction with rolled edges adds strength and resists twisting. A standard feature is the pinned 4-1/2 " saddle, so it will not lift off during use. There is also an automatic valve that prevents overloading, so you cannot exceed the rated capacity. This Napa tool is ideal for a large automotive shop, or a small one-person shop. No matter how big or how small the job, this tool will easily fit all your needs! Dimensions: 28-3/4" x 14-3/4" x 6-3/4"